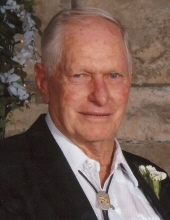 Eugene W. Sawyer, age 89, resident of Blackwell, Oklahoma, passed away Friday, February 26, 2016 in Blackwell, Oklahoma. Eugene Sawyer was born on May 16, 1926 to the late Perley and Dorothy (Lane) Sawyer in Nardin, Oklahoma. His pastimes included working outside, visiting with neighbors, and enjoying country music. He was a very loving father and grandfather who will be greatly missed by many. Eugene is survived by his children, Gary and wife Denice Sawyer, and Patricia Lockhart. His grandchildren, Connie Simpson, Jerry Smith, Kristi Sawyer, and Jeff and his wife Jamie. His great-grandchildren, Justin Smith, Alexandra Smith, Tiffany Smith, Grace Sawyer, EmmaLeigh Sawyer, Samantha Simpson, Amy and husband Robbie Harader, and Janell and husband Colton Leaming. And great-great-grandchildren Holden, Hayden, Addilyn Mae, and Lane. He is preceded in death by his loving wife, Louise, his parents, Perley and Dorothy, and his great-great-grandson, Ethan Harader. A celebration of his life will be held at 2:00 pm on Tuesday, March 1, 2016 at Mount Olive Cemetery in Nardin, Oklahoma with Tom Howard officiating. To send flowers or a remembrance gift to the family of Eugene W. Sawyer, please visit our Tribute Store. "Email Address" would like to share the life celebration of Eugene W. Sawyer. Click on the "link" to go to share a favorite memory or leave a condolence message for the family.